O Canada! Our home and native land.... There's something undeniably special about growing up in Canada. Something that we can all remember fondly. Something that unites us. As all of us Ex-pats share our best memories from our childhoods and our time spent there & all the activities that make us thankful to be Canadian. We hope they spark an interest for you to come explore every edge of this beautiful country we ALL still call home and help celebrate Canada's 150th B-day! Eh! This particular trip was a last minute trip due to my Mom becoming ill & hospitalized. As I sat on my Mom's deck overlooking Lake Okanagan, reminiscing with family about my childhood/memories. I remember stepping away to take this photo and feeling so thankful to have been raised around all this natural pristine beauty that Canada has to offer. Just breathing in the crisp, clean air was a distant memory after living in California for 20 yrs with it's smog and fast paced lifestyle. It was now the simplest things surrounding me giving me joy and comfort in a moment of despair, you could hear the Loons nearby as the light winds pushed the constant waves along the rocky beach. As I sat on that deck back in 2013 with the sun occasionally breaking through the clouds to illuminate our flag! I ate ketchup chips and drank a cold Kokanee and never felt more at home as I did in that moment. 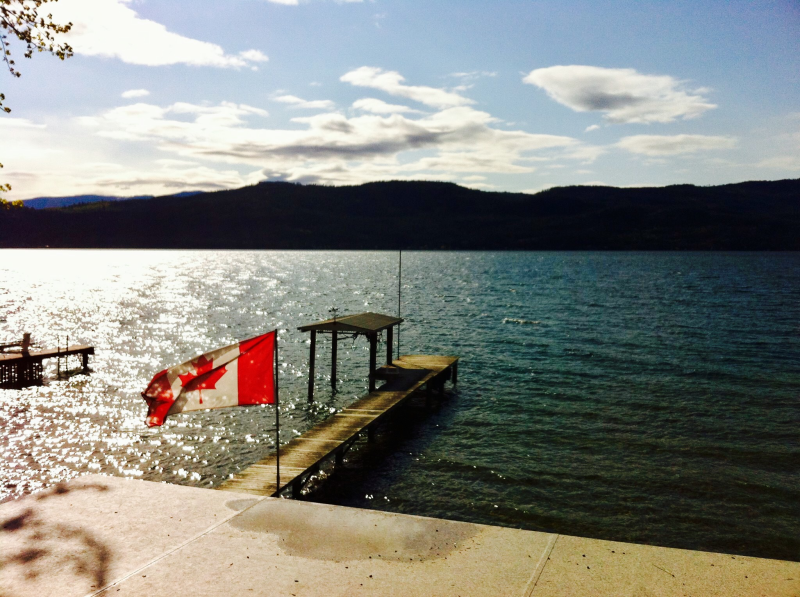 Lake Okanagan is the definition of what it says on the Provinces license plate "Beautiful British Columbia"